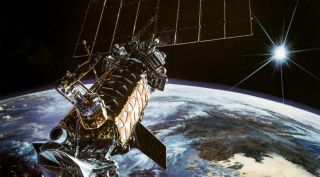 Artist's concept of a Defense Meteorological Satellite System (DMSP) military weather spacecraft. The military weather satellite that exploded in orbit last month apparently died of old age, U.S. Air Force officials say. While investigators continue to study the dramatic Feb. 3 death of Defense Meteorological Satellite Program Flight 13 (DMSP-F13), the signs currently point not to a collision with a piece of space junk or other external cause but rather to an issue aboard the spacecraft, which launched in 1995. "Basically, the spacecraft was 20 years old and experienced what appears to be a catastrophic event associated with a power system failure," Andy Roake, chief of the Current Operations Division at Air Force Space Command Public Affairs in Colorado Springs, told Space.com. Indeed, Air Force officials have said that the military weather satellite explosion was preceded by a sudden spike in the power system's temperature, "followed by an unrecoverable loss of attitude control." It was first reported by SpaceNews, a Space.com partner, on Feb. 27. USSTRATCOM hasn't said much about the loss of DMSP-F13, said Brian Weeden, a former orbital analyst for the Air Force who now works as a technical adviser for the nonprofit Secure World Foundation. "I have to wonder if USSTRATCOM informed any of the satellite operators — commercial or international — about this event when it happened," Weeden told Space.com via email. "It wasn't nearly as serious an incident as the 2009 Iridium-Cosmos collision, but it was still a significant debris event in a very crowded altitude band, and could pose a concern for a lot of the operational imagery and weather satellites in polar orbits," he added. "Even though USSTRATCOM cataloged the new pieces, I still think operators would have wanted a heads-up that there was an incident." Weeden said he finds the silence puzzling, but USSTRATCOM officials said that it shouldn't be. DMSP-F13 was an Air Force satellite, they explained, which is why information has mostly been coming from the Air Force. "U.S. Strategic Command's Joint Space Operations Center tracks approximately 23,000 Earth-orbiting objects on a daily basis. In the event an anomaly with potential debris-creating characteristics is identified, part of the notification process includes informing NASA so they can perform an independent analysis of the situation and determine if there is any immediate threat to the astronauts on the International Space Station," USSTRATCOM officials told Space.com via email. "The JSpOC also produces notifications to all non-DoD satellite owner/operators through the normal conjunction notification process, which includes performing daily analysis to predict conjunctions between all active satellites and the rest of the satellite catalog," they added. "The JSpOC issues, on average, approximately 23 of these notifications warning of potential conjunctions per day while performing its Space Situational Awareness mission ensuring the safety and accessibility of the space domain for all. In terms of this specific event, no conjunction warnings have been issued to date." "DMSP Flight 13 provided critical atmospheric data for flight operations in Operation Allied Force, Operation Enduring Freedom and Operation Iraqi Freedom," Air Force officials wrote in a statement emailed to Space.com. "During its lifetime, DMSP Flight 13 provided thousands of hours of weather imagery to the Air Force Weather Agency and the U.S. Navy's Fleet Numerical Meteorology and Oceanography Center." DMSP-F13 transitioned from a "primary" to a backup satellite in 2006. Its loss should not constitute a big blow for the military, Air Force officials said; six other DMSP weather satellites continue to gather data on orbit. Editor's Note: This story was updated at 1:15 p.m. EST Thursday to incorporate the thoughts of USSTRATCOM officials.